We're Giving Away a Bottle of Pappy Van Winkle | Valet. Some might say that Pappy Van Winkle needs no introduction. But we think it still deserves one. And the truth is, there are plenty of people who don't know much about Pappy—other than it's incredibly popular and even more hard to find these days. But we recently got our hands on a bottle and partnered with a few of our favorite brands to offer one lucky reader the chance to crack open the legendary bourbon. So here's what you need to know and why you should care (not to mention why you should enter). Known as the most coveted whiskey in the world, the desire for Pappy has something to do with its scarcity. The brand has a problem any alcohol manufacturer would kill to have: It generates an incredible amount of hype as a rare, yet must-have, American whiskey. Just 7,000 bottles hit the market each fall, a sweet spot that experts say is just enough volume to generate real demand, but not enough to flood the market. As a result, the bourbon—produced at Buffalo Trace Distillery in Kentucky under a joint venture with the Van Winkle family—immediately sells out to fans who turn to apps to locate a local bottle. The rest are forced to pay higher prices on the resale market. The other thing making people clamor for this stuff? The taste. It's just about won any and all spirit awards and medals. Those in the know attribute Pappy's delicious taste to the distiller's heavy use of wheat over rye or corn. This gives the final bourbon more velvety smoothness and less bite. The 15-year-old Family Reserve, which is the bottle we've procured, is our favorite. Aged long enough to pull all the rich character from the charred barrels and infuse the grain, there are delicate notes of spice-roasted nuts (think toffee and vanilla) and dried fruits (black cherry and orange). The finish is surprisingly smooth for a 107 proof spirit, perfect for sipping like a proper gentleman. So go ahead, try your luck and enter now. 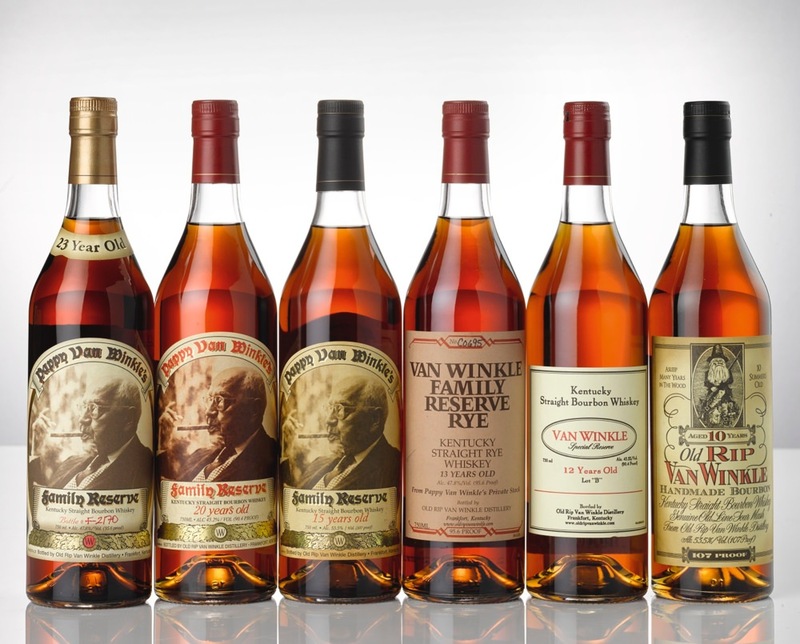 Pappy Van Winkle isn't just a catchy name; he was the family's pioneering patriarch. The bourbon icon started out as a liquor salesman in the late 1800s and later ran his own distillery.